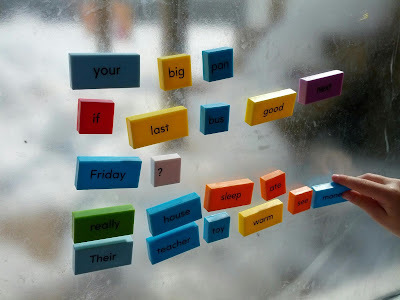 I have come across numerous blog posts about creating a sticky wall with contact paper. 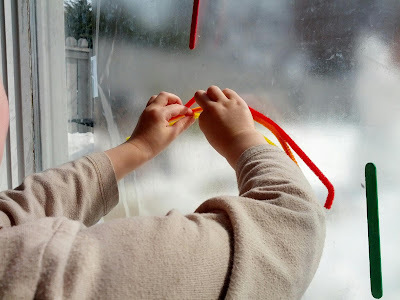 Unfortunately, I hadn't stocked up on contact paper since Halloween, when the boys and I made some super cute window decorations and used up the remainder of my supply. However, just before Easter, I stocked up so that we could try it out. I chose to create a sticky window instead of a sticky wall because I love the added element of natural light. 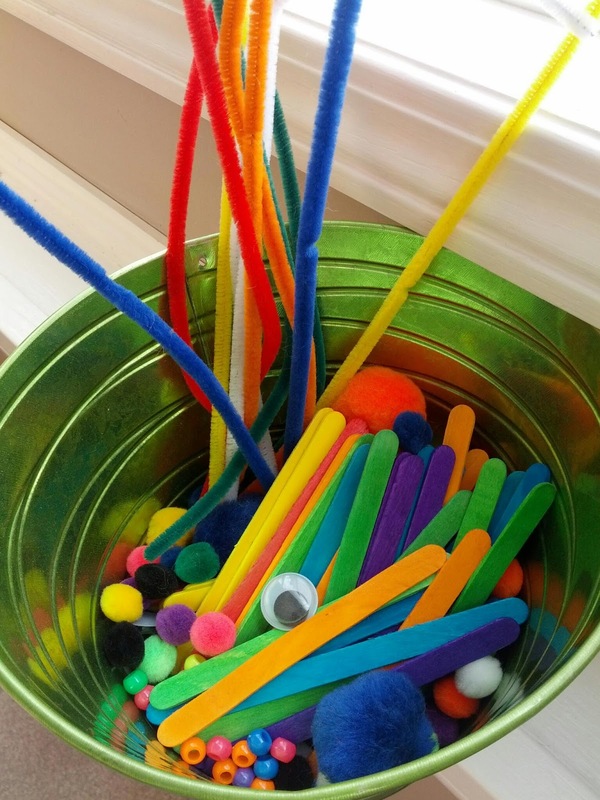 A close up of the items in the bucket. I taped a large piece of contact paper to the large window in my living room and placed all of the items in a bucket. The invitation to make some window art. Since K was napping, J had this invitation all to himself. K did try it after his nap, but lost interest after about five seconds. J, on the other hand, had a lot of fun with this invitation. He was initially drawn to the popsicle sticks. 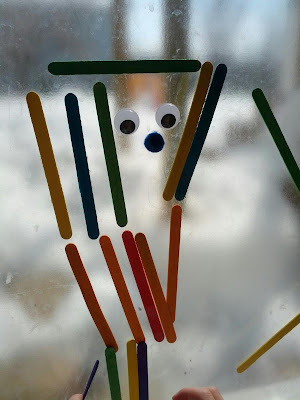 Eventually, he made a popsicle stick person. J was so descriptive while making this character. 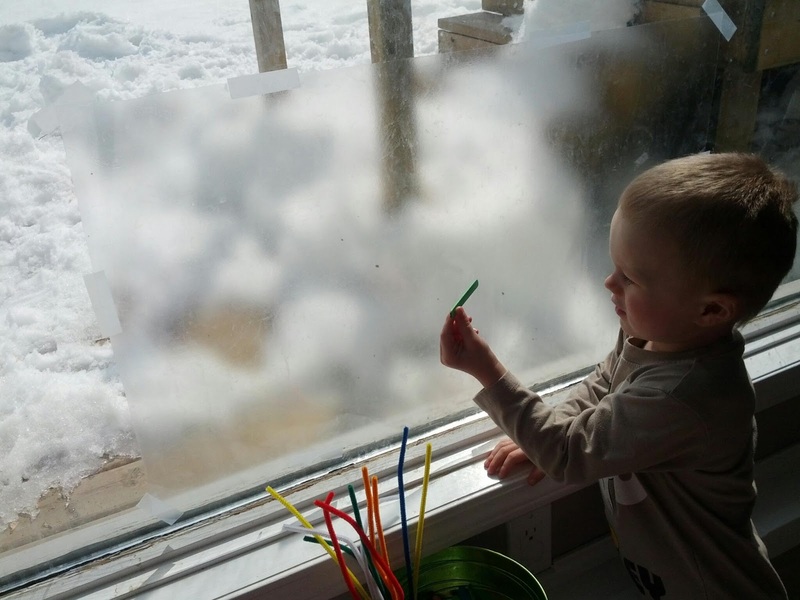 It was great to see his imagination working away. 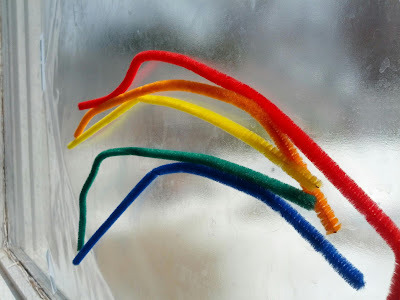 The pipe cleaners were used to make a rainbow. Whenever J makes a rainbow, he always sings "The Colors of the Rainbow" song from Signing Time. This rainbow was no exception. Starting to build a rainbow. The finished rainbow (sans purple). We didn't have any purple pipe cleaners. 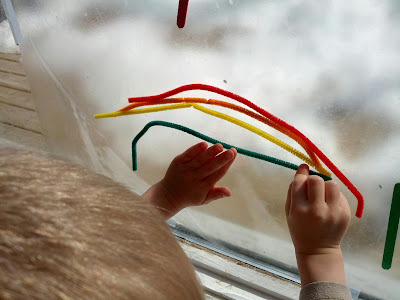 J eventually found other items in the living room to stick to the window. Sentence Building Dominoes - J received these as an early Easter present from my parents. They are awesome. Putting sentence building dominoes up randomly. Contact paper is definitely a staple in my craft desk. And this activity is just another reason to keep even more in stock. Ok, where do you get contact paper? Never seen it before. You can find a small roll for $1 at Dollarama. It's called vinyl book protector there. Off to Dollarama I go! I have been looking for some. Of all the things he made, I love the popsicle stick person the most. No one got stuck here. 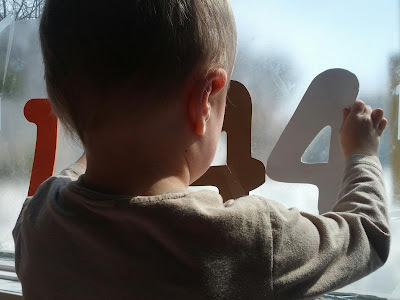 :) However, K tried to rip the entire piece of contact paper off the window when he saw it.